← Outdoor Adventures: What to Pack? 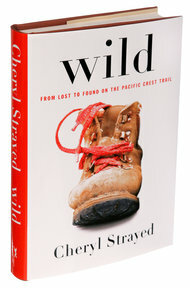 I recently read Cheryl Strayed’s Wild: From Lost to Found on the Pacific Crest Trail and loved how Strayed tells her story of a life-changing adventure hiking the Pacific Crest Trail. She’s funny and honest and real. Strayed sets off to hike the PCT in the midst of grieving over her mother’s death and a recent divorce. She’s able to tell a balanced story that offers the details of an exciting adventure and reveals the emotional depth that underlies it. Strayed does most of the hike alone, but along the way, she encounters rattlesnakes, endures excruciating blisters, and pushes herself to achieve new mental and physical limits. She meets a host of interesting characters along the way, but she emerges as the most interesting one of all. The Pacific Crest Trail begins in Mexico and ends in Canada, crossing through California, Oregon, and Washington along the way. It crosses through both the Sierra Nevada and the Cascade mountain ranges, so Strayed covers a lot of high ground on her journey. She tells about hiking across snow slopes and learning how to use an ice axe to self-arrest in case she falls. Even though she bypasses a particularly snowy area in the Sierra Nevada, she encounters snow in many other areas and has to cross the snow slopes that she fears. Enjoy Wild–and get out there for some good mountain adventures this summer while you’ve still got a few months left! Photo © Alessandra Montalto/The New York Times; Jacket: Alfred A. Knopf. Hiking across snow-covered slopes in the summer requires a specialized set of skills and techniques. Learn how to survive this challenging terrain by knowing what to do when you encounter it. These step-by-step descriptions and photos demonstrate how to stop yourself from sliding down a snow-covered slope. This entry was posted in Rescue Skills & Techniques and tagged Cheryl Strayed, hiking, ice axe, self-arrest, survival skills, Wild. Bookmark the permalink. How does it feel to agree with Oprah? 🙂 She picked this as the book to use to restart her Book Club. Hello, there!! I think that Oprah made a great choice. This book is inspiring, empowering, and well-written…these things seem to be themes in her Book Club choices. Hope you read it…and enjoy it!